The goal is a convenient fire safe location for magnetic media. Haivng an off-site location for media is readily available for those who routinely travel to a site that is physically different from their residence but a problem for me as I work out of my residence. Fire proof safe's are often the first item thought of for fire protection. For paper based items it may be good enough - but for plastic / hydrocarbon based items they most likely will melt well before paper based items would be degraded. 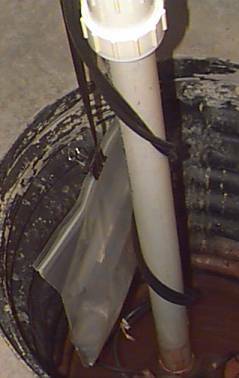 The next solution, available to me, would be a below grade pit filled with water - the sump pump pit. VHS tape used to suspend the media bag. 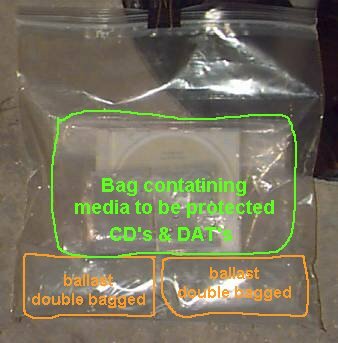 Magnetic media tape used as it will melt (hopefully before the media bag is degraded) and release the media bag into the water.